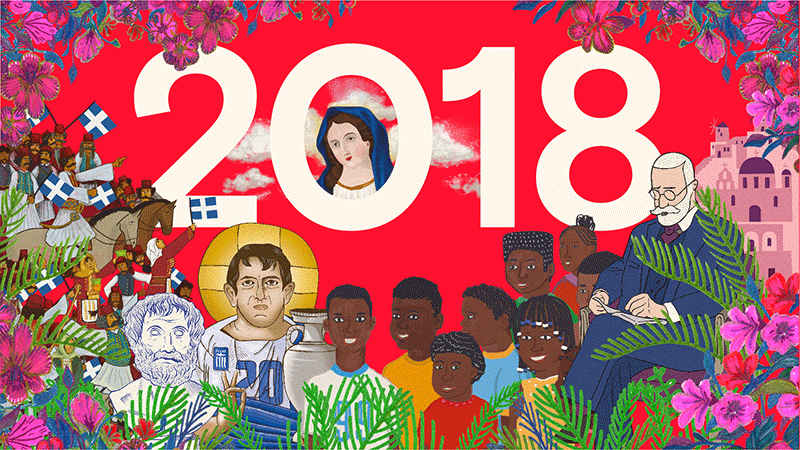 Die bereits aus der Slanted #30 – Athen Augabe bekannten Designer von Bob Studio haben in Zusammenarbeit mit Hartovasilion einen illustrativen Wandkalender für das Jahr 2018 entworfen, der nur so vor Farben strotzt. Der limitierte Kalender ist ein Must-have, der einem dank der humorvollen Illustrationen garantiert das Jahr 2018 versüßt! Is there any Logic in the Evil Eye? Who is the Eternal Student and what does he have to do with Greece winning Euro 2004? After dipping your bread (Papara) into a greek salad wouldn’t you like to use a Toilet-Scale? Can Oedipus Complex be cured with fried salt cod in garlicky potato puree (Bakaliaros Skordalia)? All answers lie in this unique 2018 calendar of Greek patents and Greek Reality Landmarks designed by the awarded design agency Bob Studio in collaboration with the amazing Hartovasilion. A limited design calendar with a sense of humor and great aesthetics that will hang on your wall with pride. Previous editions of the same series have been awarded for their design and illustrations in Greek and European Design Awards.